I made macarons a couple of days back. Well..tried to make would be more apt. I started with major enthusiasm but by the time I was done with sifting the damn ground almonds twice, all I could think of was a nice glass of wine and a movie. I somehow wanted to get it over and done with, which resulted in macs with feet, oh yes, but crinkled tops and weirdly shaped ones. While the macs were set aside to rest for an hour, Ro came by the kitchen and he even had the audacity to say 'looks like rats pissed in small pools.' Thank you very much, you shall sleep on the couch today, was my reply! Anyhoo, the macarons were a disaster and they are still on my table, waiting to go into the bin, but I'm waiting, for what? I don't know. I should just go chuck it right this minute. So after my macaron disaster I was a bit bummed because the sun was out shining and it was perfect for photography. I had major plans with the macs and was a lil disappointed. And then, I decided to browse (my own blog that is, how vain right?) and I came upon my all time favourite recipe..the French Yoghurt Cake. Of course, I shall just make these to prove that some things do come out nice, was my first thought. So I went and did one quick check to see if I had all the ingredients. Other than 1 egg, I had everything else. And then my second thought, why not improvise? Something I'm not very comfortable doing, especially with cakes, but what the hell...if it was a day of disasters, then I shall add fuel to fire. So I got hold of some passion fruit lying around (begging to be used) and decided to make a cake. In between all this I convinced (begged) Ro to go out to the store and buy me eggs. The fact that he came back with a whole grocery bag full of rubbish is another story, but hey I got my eggs, I shall not complain. These lil darlings are so so so so so good, you will finish it all up in one go. They are also so easy to put together..no beating things separately, put it all into one bowl and there, you have the batter. You don't even need a beater. The recipe has never failed me and now that I know it can be improvised, its a winner. 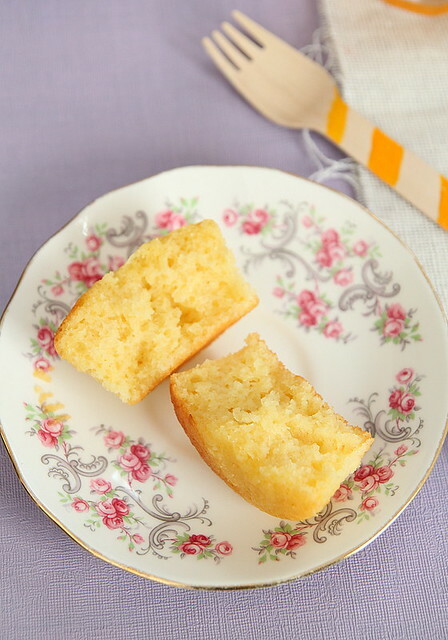 They are the softest, moistest cupcakes I have ever had and its because of this same reason that I use them as the base for all my upside down cakes. No fail recipe peeps, no fail. Even for amateur bakers, this is a brainless one, so do try it and tell me how it was. Here's the recipe. Into a mixing bowl whisk together (using a wire whisk, or even a wooden ladle) the first five ingredients till pale and well mixed. Sift over the flour, baking powder and salt and continue to whisk, making sure no traces of flour is visible. Add the oil and fold it all together to get a smooth, slightly loose batter. 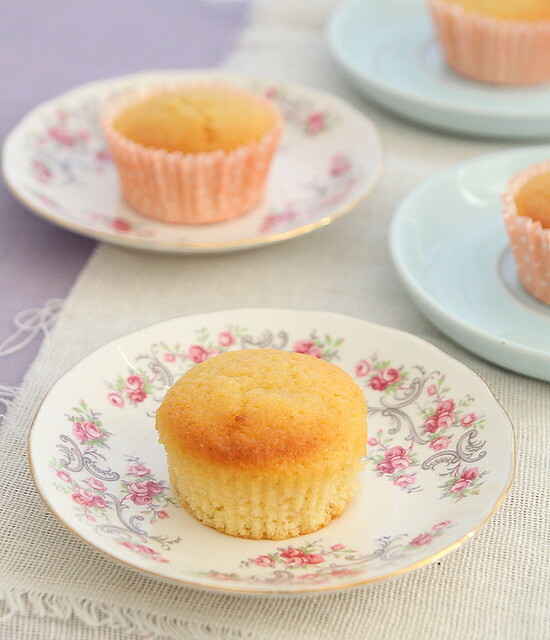 Arrange the cupcake liners into the tray and fill each cup with the batter, till about 3/4th full. 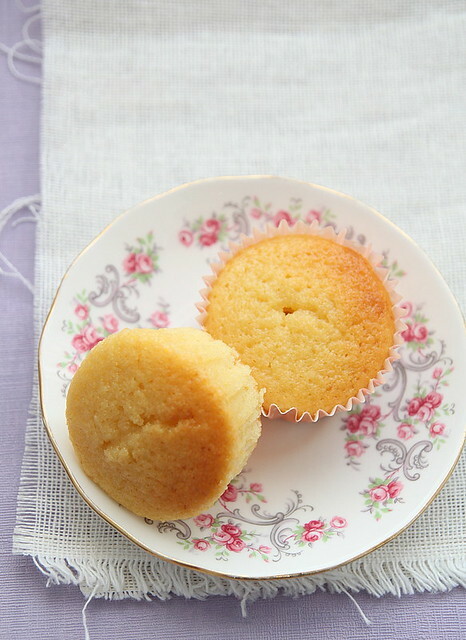 Place the cupcake tin on a tray and bake in an oven pre-heated at 175C for about 20 to 22 minutes. I accidentally keep it for about 3 minutes longer and the tops began to brown. You know your oven best, so bake accordingly. Do the skewer test and if it comes out clean, take the tin out of the oven and leave to cool for about 5 minutes after which you can carefully remove the cupcakes from the tin and leave to cool completely on a wire rack. Notes: Feel free to experiment with any type of fruit juice. Replace passion fruit with orange juice, lemon juice (maybe a little less than the mentioned amount), or even honey to get a different flavour. Also add some lemon/ orange zest to the batter. If you cant find fresh passion fruit, you can use passion fruit juice instead. May be a bit on the sweeter side, so adjust sugar accordingly. *Scoop out the flesh from the fruit and run it through a sieve to get the juice. The seeds and pulp taste yum, so don't throw it off. You can eat it all up (like I did) or mix with some confectioners sugar to do a glaze and pour over the cupcakes. PS: On a different note... in case you are wondering what all this Sponsored Posts and videos are doing on my blog, its just that I have registered with a few marketing sites and they pay me to put up articles on certain products. Its just some pocket money generation for the blog to quench my prop shopping, ingredients sourcing fetish. So on and off you will find these posts and please don't be disheartened by the recurrence. If it is becoming a hindrance, I shall be the first one to take them off. Thanks for understanding. Looks so tempting...love the texture of the cake...yummy looking cake!! Wow these look so good! I have tried this recipe with strawberries but didn't like the result- I should have used juice instead- thanks for the tip! 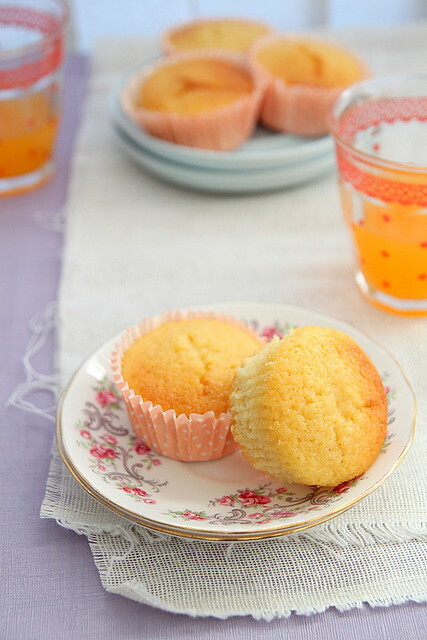 The cupcakes look amazing...lovely crumb! Sorry abt the mac fail but love Ro's comment. So well expalined and love that soft and spongy cuties. Love the colour and tempting clicks.wish to try some right nw. Superb. 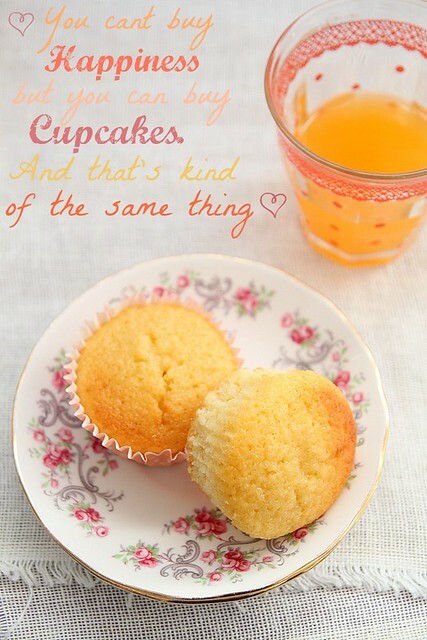 Hey, I still use your recipe for yogurt cupcakes with improvisations! Now I have to check your upside down cakes.... I have papaya, bananas, plums, strawberries and grapes waiting to be used! mmmmm..this looks so tasty..soft and spongy..And the color makes it even more beautiful..
Love this combinations and they look so good! 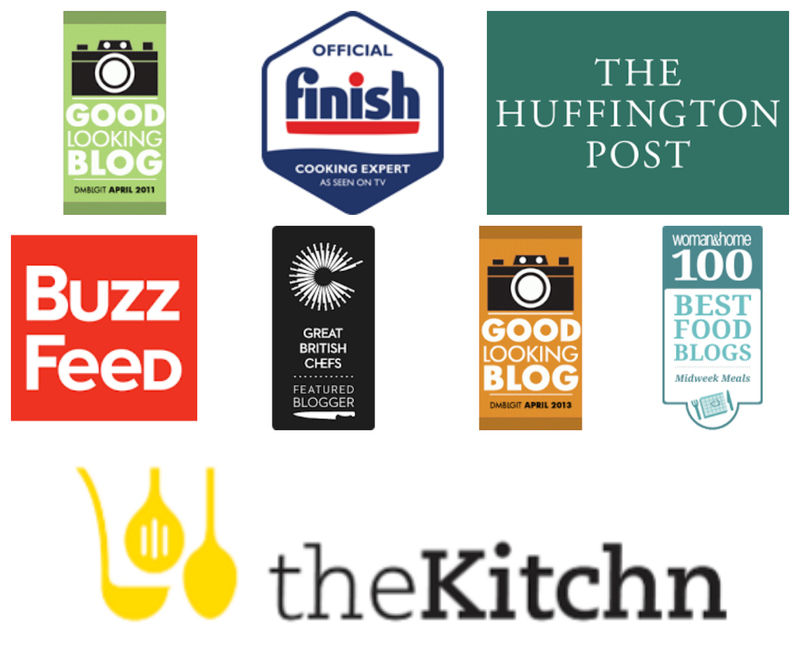 Great Blog here, wish I could really cook like you. I like the macaroon wrap and the macaroon itself looks so moist and fluffy.. Thanks for the recipe! We didn't taste much of the passion fruit flavor but the flavor was more balanced than a vanilla cupcake and not too sweet. My boyfriend enjoyed it and he's not much of a cake-lover. I left mine in the oven too long (we just moved to Botswana and I'm still learning how to use our oven) but the caramelization was a nice touch. The texture like sponge cake.